The weather in London is gorgeous today. When I took Miles for his walk, the temperature was mild. There was a slight breeze and the sky was a brilliant blue without a cloud in sight. This is the type of weather I love. Each winter I long for hot summer days. Then after a couple of hot days, I want autumn weather. I used to love hot weather. As I get older, I find it disagreeable. For today’s travel photo I decided to showcase London. 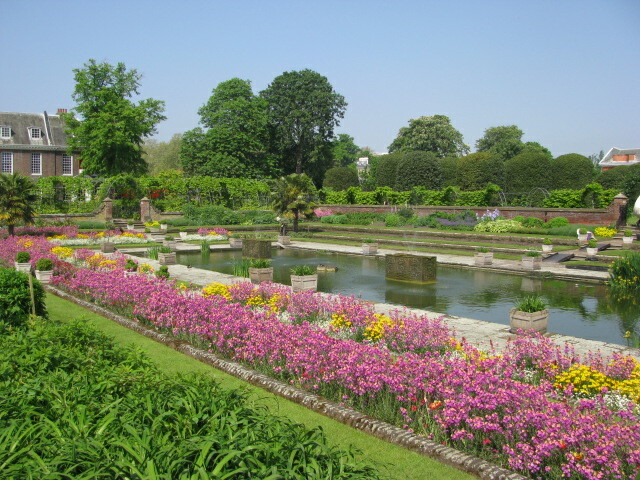 I took this photo earlier this summer in the Sunken garden outside of Kensington Palace. I should wander over soon and check out the fall colors. This entry was posted in Travel Photos and tagged 50 Year Project, Autumn, Blue Skies, England, Flowers, Kensington Palace, Life, London, Nature, Photography, Summer, Sunken Garden, Travel, Travel Blog, Travel Journal, Travel Photo, Weather. Bookmark the permalink. What a beautiful photo. Like you, my favorite days are those sunny days when you can walk or sit in the sun for hours and but not get too hot. I am looking forward to Autumn myself! I love sitting outside, not getting too warm so I don’t have to worry about getting burned. I don’t tan, I burn. I wish you a beautiful Autumn! I think we’ve switched weather today. It’s usually brilliantly sunny in the Catskills (well at least in the summer) but today is drizzley and damp. Fall is around the corner for us. I’ve never been to the Catskills, but hear that it is lovely. Enjoy the drizzle, if you like drizzle. I’m a fan of gloomy weather, since it’s perfect for reading. That’s just beautiful. The last time we were in London it was the end of August, beginning of September and we had the most gorgeous weather while there. It was just perfect! This September has been great so far. I moved here last September and was surprised how beautiful the weather was here. I’m hoping for another great autumn. Thanks! It has been so hot here and now it is going to cool off dramatically! I am happy in a way, but also am dreading the snow. Ugh. Thanks for the glimpse of London beauty today! Unfortunately, snow quickly follows autumn. I hope it isn’t too bad for you this year. And you’re welcome. I hope so too… contemplating spending a month with our son in Raleigh…. That sounds wonderful. Have fun! Thanks!! Will be there for a week next week so that may have to do me! This is beautiful. Love the colors, and how neat/tidy/even everything is. There’s nothing like that in my garden! They have many gardeners to make sure everything is perfect. I’m sure your garden is lovely as well. We have returned to rain and now a southerly has come in dropping the temperature. But with my daughter in Wichita I long for some of her warmth. She tells me it is 42%C over there and iIthink maybe not. Growing up in Australia I remember similar temperatures during the summers, but as I get older such extremes seem well…extremely uncomfortable. A garden fit for royalty 🙂 Fortunately the masses can enjoy it as well. That’s true, that is why the gardens are there – everybody can come and enjoy! That looks like a nice Springtime shot! The colors are beautiful! So jealous of your beautiful walking spots! I’m really fortunate and I do my best to appreciate it. Thanks! No! Don’t wish us into autumn! The colour won’t arrive until late October. It is. I love to visit and they have benches, so I can sit and read. Beautiful picture! Love the colors! What a beautiful day it must have been! I much prefer cooler weather, too. It is very humid here in NJ right now! I was just in NY and the humidity was horrible. I hope the cooler weather arrives soon, but no more tornadoes. I hope all is well.